Ross Collard weighs in on whether there should be a testing/quality glossary. Micah Martin introduces the open source tool FitNesse. Tim Van Tongeren tells the story of how an internal progress poster became a popular gathering spot and information resource. Tom McGreal warns you of problems that may be lurking in your deployment environment. Much has been written about how agile processes change the developer and tester roles, but what effect do they have on the manager? Learn about three “extreme” concepts and what they mean to the software manager. Wouldn’t it be great if test scripts were written in terms of what they were trying to accomplish instead of in terms of which button to click? It would certainly make them a lot less fragile, and much easier to understand. Find out how capture/replay at the business and control logic level can help you accomplish this goal. Pinocchio had Jiminy Cricket; your company has Software Quality Assurance. Both are intended not to enforce good practices, but to encourage them. Find out how SQA can effectively serve an organization. How do you know when your software is done? How do you determine which bugs need to be fixed and which can be tabled for "someday"? Robert Sabourin defines a seven-step process for establishing an effective bug triage system. Among the hardest things to explain is something that everyone already knows. We all know how to listen, how to read, how to think, and how to tell anecdotes about the events in our lives. As adults, we do these things every day. 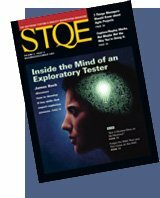 Yet the level possessed by the average person of any of these skills may not be adequate for certain special situations.Exploratory tester James Bach describes eight key skills that expert explorers possess, and how you can develop them too.